Columbia Heights Luxury Apartments in Washington, D.C.
Columbia Heights is a vibrant neighborhood in the northwest quadrant of Washington, D.C., bordered by 16th Street to the west. The opening of the Metro station served as a catalyst for economic development and residents. Columbia Heights is one of Washington's most diverse neighborhoods, composed of retail, condominiums, rentals, and single-family homes. 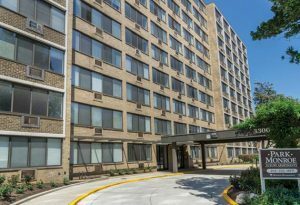 The Park Monroe features bright, spacious, newly-renovated studio and one-bedroom luxury apartments. Residents enjoy Berber carpeting, ample closet space, and private balconies in a safe, secured building. 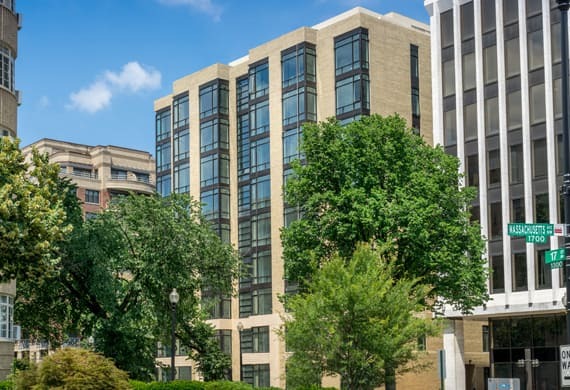 Conveniently located at 3300 16th Street in NW Washington, D.C., between Mount Pleasant and bustling Columbia Heights, The Park Monroe is ideal for those who work in and around the nation’s capital. We welcome your inquiries about apartment pricing and availability. Please call (202) 332-1899, or email parkmonroe@keenermanagement.com to learn more and schedule a viewing of our Columbia Heights luxury apartments. Our professional representatives are ready to help you find your ideal apartment. Learn more below about the features and fascinating history of Columbia Heights. Bordered by Howard University to the east and the artistic U Street Corridor to the south, Columbia Heights is an academic and cultural hotspot. The GALA Hispanic Theatre is among the city’s cultural icons, featuring a variety of Spanish language films and plays. Among the city’s most treasured gathering places is Meridian Hill Park (often called Malcolm X Park), a 12-acre green space in the southwest corner of Columbia Heights. For more than 50 years, a standing Sunday afternoon drum circle in the park has drawn a splendid variety of talented dancers and musicians. Residents also enjoy a modern community center featuring an indoor fitness center, game room, music studio, dance studio, stage, computer lab, classrooms, and more. The area features nationally-recognized retailers, including Target, Staples, Bed, Bath & Beyond, and Best Buy. Despite the city’s ongoing transformation, several restaurants and cafes have survived and thrived over the years, including Taqueria Distrito Federal and Sticky Fingers Sweets & Eats bakery, favorites among local residents. Nightlife, including bars, clubs, and concert venues, are abundant in the area. The U Street Corridor, Adams Morgan, and Lower 14th Street are popular destinations, all within walking distance of Columbia Heights. Formerly a sprawling farmland, Columbia Heights grew into a suburban area shortly after the end of the Civil War. In the early 1880s, Senator John Sherman purchased an area of land north of Boundary Street between 16th and 10th Streets. He called it Columbia Heights in honor of Columbian College (today, George Washington University). The city underwent a period of upscale development around the turn of the 20th century with the goal of attracting members of the upper echelon, including Supreme Court Justices and high-ranking military officers. Today, the neighborhood still serves as a central location for many of the nation’s active politicians. Jazz legend Duke Ellington purchased his first home in Columbia Heights in the 1920s, and the town became a jazz and music haven for struggling and would-be artists. An epicenter of civil unrest after the assassination of Dr. Martin Luther King Jr. in April 1968, the city has since been cited as an example of multiracial, mixed-income stability. Columbia Heights has undergone major revitalization efforts in the last decade, spawning new commercial developments, shopping centers, and modern apartment complexes. Today, it is a multiracial and socioeconomically diverse community that attracts professionals and families alike. Call our professional representatives at Keener Management to learn more about apartment availability in The Park Monroe. Call (202) 332-1899, or email parkmonroe@keenermanagement.com.